"beneath the gleam of whose tawny eye the brute creation quail"
Patriarch of the Busanga PlainsThe African Lion remains endangered throughout its existing range, primarily threatened by human, livestock and commercial encroachment resulting in less land for them to roam, hunt and survive. This is the most critical threat to the survival of the African Lion - without secure range land where they can roam and hunt prey animals there can be no effort to save this magnificent predator. Land for Lions seeks to provide alternative initiatives to securing and increasing total biodiversity protection through innovative methods of forest and wildlife management by ensuring community participation, acceptance and benefit. We are primarily a conservancy based land and wildlife preservation initiative adapted to conditions and issues encountered in and around the Protected Areas systems in Northern and Western Zambia. Less than half of the 234,000 square kilometers of Zambia's Protected Area System still remains perfectly intact. Most smaller National Parks have been overrun and decimated while a recent study concluded that only 3 out of the 34 demarcated hunting zones were properly managed and conserved. To be sure, the policy governing Zambia's wildlife sector has not kept pace with an ever changing environment driven primarily by financial necessity as well as the surging human population. The future as we see it lies in identifying the remaining, undisturbed habitat and ecosystems which lie both within and outside of Zambia's Protected Areas including cold spots of biodiversity, AND doing our utmost to secure these lands on an already proven private public partnership basis where all stakeholders can claim benefit while doing no further damage. The Land for Lions program is both internationally innovative and locally rooted recognizing the importance of keeping pace with environmental threats, developments and solutions while applying and adapting them to on the ground conditions and challenges. Participation is the cornerstone of our mission because we realize that despite differing opinions, emotions, philosophies and methods, for those who really care, the goal is the same - saving the African Lion. make a difference where it counts - on the ground in Africa. We are looking for experts in various fields to help with our community and science based goals - more here! Throughout written history Lions and humans have had a fractious relationship, well documented by early colonial travelers and Hollywood movies. Some prides of Lion specialised in killing humans as their prey while others would take people when weak or injured. Make no mistake, Lion are dangerous, they are not cute and cuddly and "they will eat you and your little dog too!" Hence the importance of finding modern day solutions to human - predator conflict situations - unfortunately for the African Lion, today humanity has the upper hand and they will always lose this age old battle! 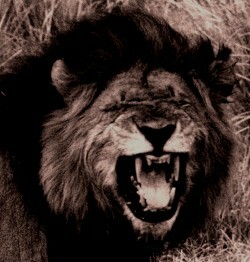 The best method to age an adult male lion is by inspecting these magnificent fangs - anybody want to sign up? Land for Lions - © 2019Land for Lions All Rights Reserved.